I look closely at plants, primarily cacti, succulents and flowers and view them and their components as little sculptures. Their natural forms are inviting and I am fascinated by the act of their growth. I explore this notion of their life force in my work. Collections of natural objects are of interest to me and I aim to capture their essence in my creative process. Laid out on tables or shelves, they become specimens of the natural world. 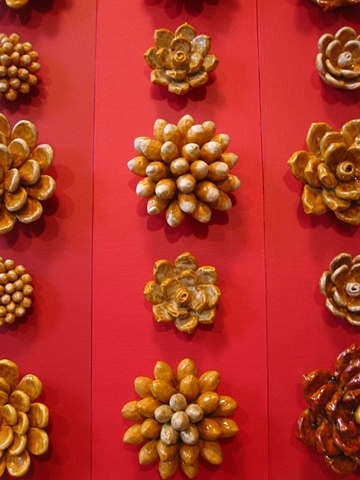 Hung across a wall, they are botanical worlds created in clay. My embroideries are intricate and intimate. I hope to bring the viewer into my detailed process with color and beauty. Folk art, nature and portraits are inspirations. Ornate, architectural details from such countries as Spain and India, as well as the brownstones of my Brooklyn neighborhood are influences. The interior and exterior window and door treatments are sources as well as interior design elements such as patterned wallpaper, rugs, fabrics and tiles. Allowing the material to speak for itself I embrace the clay's tactile quality and am inspired to create sculpture and installations that merge the above elements together.